We’ve lived in North Carolina for a little over two years now and we still haven’t had the chance to explore very much. One of the reasons we were so excited about moving here is that there seemed to be so much more to do in the area–well, at least compared to Wisconsin. (No offense, Wisconsin.) We had plans to drive to the mountains or coast once a month, to do weekend trips to Virginia and Washington DC. And in two years, we’ve hardly done any of that. Kind of sad, right? It seems like there’s always something getting in the way of this stuff–working longer hours than we should, spending weekends running errands or doing things around the house, that kind of thing. And then before you know it, you’ve lived someplace for two years and you haven’t even seen it. So I’m making it my goal for the rest of the year to see more North Carolina sights, do more North Carolina things, and eat more North Carolina food. Like grits! I first tried them last month–I ordered a veggie burger and the options for sides were fries, a baked potato, or cheddar grits, and on impulse, I replied “Grits!” when the server asked which I wanted. And then as soon as he walked away, I thought, “Oh crap, why did I just order grits? Who eats grits with a burger? !” But I ended up loving them, which shouldn’t have been a surprise since I love polenta too, which is kind of similar. Hooray for corn-based porridge! 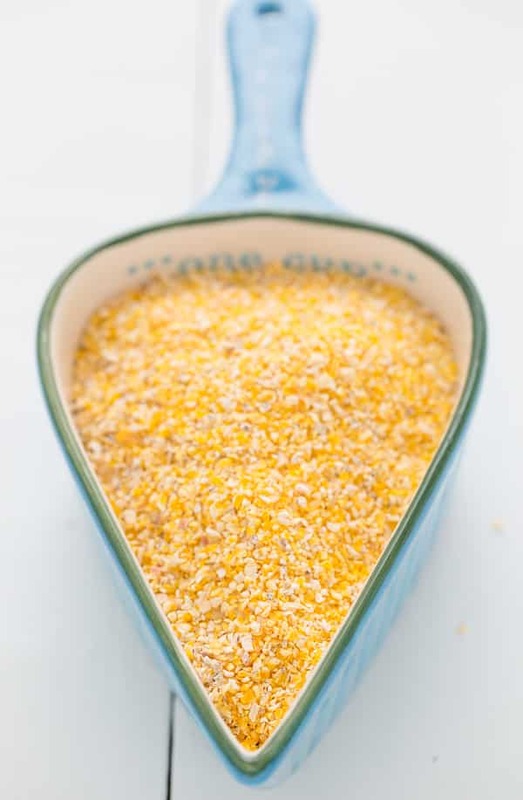 I used a local brand of yellow grits (Julia’s Pantry Organic Yellow Grits) in this recipe, although traditionally grits are usually white. You can use quick cooking grits too if you prefer–just follow the directions on the package, since they’ll have a much shorter cooking time. 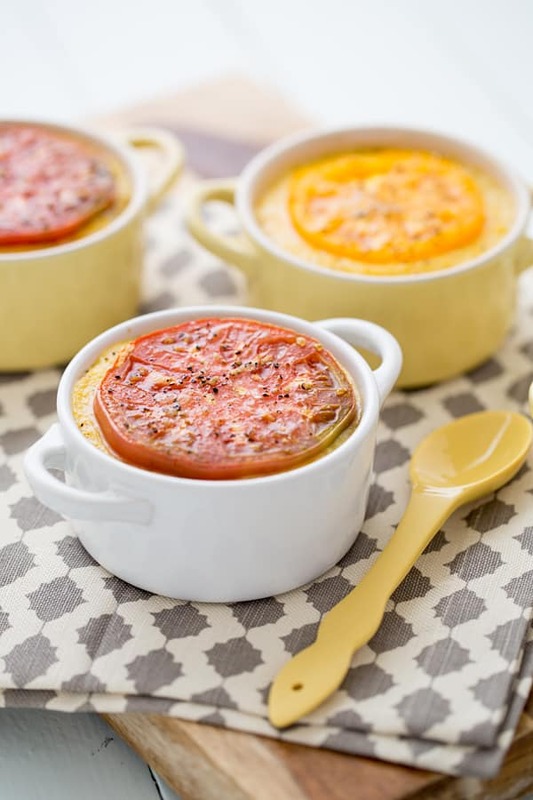 After the grits were finished cooking, I whisked in some smoked cheddar cheese, divided them into large ramekins, and topped each one with a slice of heirloom tomato that I had bought at the farmers market that morning. I’m not a fan of raw tomatoes, so I put the ramekins under the broiler until the tomatoes were soft and just beginning to blister. I don’t think I’m going to be trying North Carolina barbecue anytime soon and if I do the whole biscuits-and-gravy thing, I’m going to have to figure out how to pull off a vegetarian version, but grits will definitely be a staple in our pantry from now on. Creamy cheddar grits topped with broiled heirloom tomatoes. Bring the water and milk to a boil in a large saucepan. Whisk in the grits, cover, and reduce heat to low. Stir often and cook until thick and creamy, 30-45 minutes. Preheat broiler. Remove saucepan from heat and whisk in the cheese, garlic, and butter, then season to taste with salt and pepper. Divide the grits into four large ramekins that have been sprayed with oil or cooking spray. (If you don’t have large ramekins or mini cocottes, about 6 small ramekins will work.) Top each ramekin with a slice of tomato, lightly spray the tomato with oil, then sprinkle a little additional salt and pepper on top. 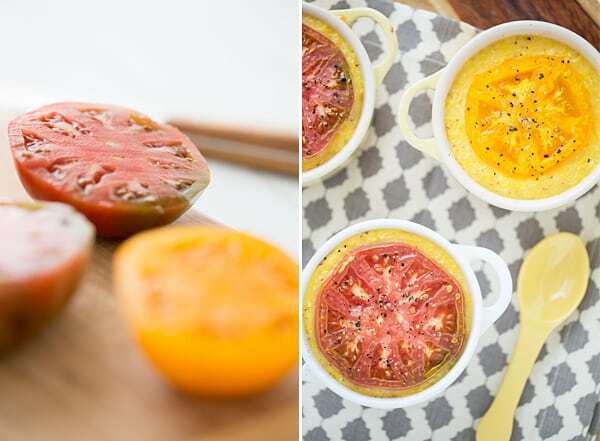 Place ramekins on a baking sheet and broil for 5-10 minutes, or until the tomato is softened and starting to blister. this looks delicious! I wonder — would it work as well in a 9×12 pyrex? I’m having a brunch party next weekend and, though the ramekins are adorable, don’t have enough to do something like that.